Our club’s Wine Fellowship met at Mike Wilson’s home for a BYO wine tasting on Monday the 18th January 2016. We snacked on bread (Whole Food’s; Italian, Ancient Grain, and cranberry/walnut) and crackers, with grapes and chocolate-covered strawberries. We also had some Beautiful Bruschetta’s, warm Rachel Ray spiced shrimp on sticks, two Marvellous Marieke Gouda cheeses, a triple cream beautiful Brie served with sliced apples, an artichoke dip (with some tasters requesting the recipe) and salami/pepperoni wrapped Mozzarella straws. Going with these were some marvelous wines sorted into groups. These included an Alsatian Pinot Gris and a Spottswoode Sauvignon Blanc, followed by a Miner Chardonnay and a Guigal Cotes du Rhone white blend. We next tried an Unti Segromigno (Sangiovese and Montepulciano), an Adelaida Cinsaut, and a Gnarly Head Merlot that were all Wonderful Wines. The last series was Owen Roe Ex Umbris Columbia Valley Syrah and an old (2002) Amon-Ra Shiraz from Australia (hence Shiraz and not Syrah), and a Decoy Zinfandel. I rated 4 of the wines as exceptional and the rest as excellent quality, and we all had a great time. Aaron Olver previewed the future of University Research Park with Rotarians Wednesday, January 13. Olver is the Managing Director of the University Research Park. Established in 1984, University Research Park, a UW-Madison affiliate, is an internationally recognized research and technology park that supports early-stage and growth-oriented businesses in a range of sectors including engineering, computational and life sciences. Olver shared the strategy underpinning the park’s direction. It has three purposes: support UW-Madison via real estate; commercialize UW research; and make technology transfer more fruitful. Originally the park wanted to attract employers, Olver said. Rather they had more success attracting small entreprenerus. We accidentally become a real estate developer, unique nationally, he added. He answered the question of the biggest challenge being transportation, since so many professionals live off mass transit lines. 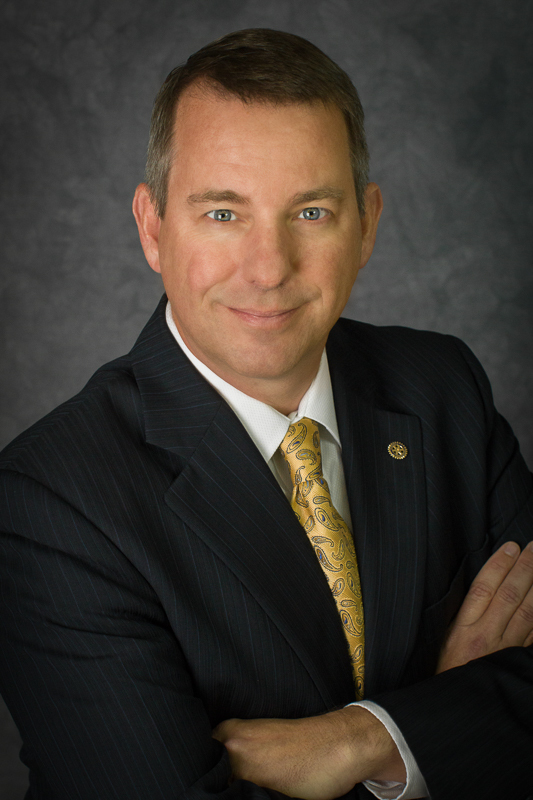 Olver previously served as Director of Economic Development for the City of Madison. Prior to joining the City, Olver spearheaded Wisconsin’s economic development efforts as Secretary of Commerce under Governor Jim Doyle. Olver earned an undergraduate degree in Economics from UW-Madison and a graduate degree in Philosophy, Politics, and Economics from Oxford University, Oxford, UK, where he was a Rhodes Scholar. CLICK to watch the video of this presentation on our club’s YouTube Channel. As a three-time beneficiary of the Mohs surgical procedure at the Mohs Clinic of UW Hospital, this reporter was especially interested to hear Fred Mohs talk about his father, Dr. Frederic Mohs, Sr. Born in 1910, Dr. Mohs was a medical pioneer. Although he intended to be a radio engineer when radio was the popular technological rage, he got a college job at Birge Hall at the UW. A prominent cancer researcher introduced Dr. Mohs to the work being done in the 1930s on cancer: what exactly was it and how could it be treated? His mentor changed the trajectory of young Fred’s career. He went to medical school. Dr. Mohs was an admirer of Thomas A. Edison, and he used Edison’s technique of intensive experimentation until he found that zinc chloride in a paste could kill cancer cells while still preserving cellular structure. Much of Dr. Mohs’s work was funded by WARF’s first research grants. He applied this compound to tumors of the skin to kill the cancer, while allowing a pathologist to determine whether the cells on the periphery were cancerous or normal. Very large and invasive tumors, which other surgeons were unable to excise, were now susceptible to treatment. Dr. Mohs early-on learned the difficulty of communicating medical science to the general public. An interview with the Wisconsin State Journal about his technique resulted in a headline: “Cancer Cure Discovered.” Colleagues were outraged. His license to practice medicine was threatened. Eventually, especially after Dr. Mohs successfully treated a prominent Madison physician for a very large neck tumor, the value of the Mohs procedure was generally recognized. Today, the Mohs procedure is widely used. In combination with an onsite pathologist, and working closely with plastic surgeons when needed, Mohs clinics allow surgeons to remove skin cancer with a minimally invasive and disfiguring procedure. Thank you Dr. Mohs, and thanks to Fred for telling us the story. 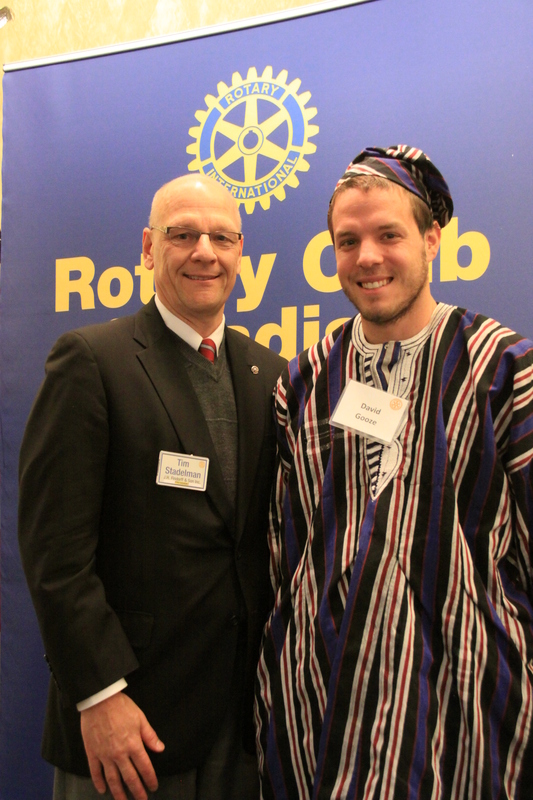 As Rotarians listened to David Gooze [pictured here (right) with Club President Tim Stadelman] at the November 26 meeting entertain them with stories of his Peace Corps experience in Togo– everything from sacrificing goats to navigating 40 languages or being startlingly awoken by calls to prayer from the mosque at 5:45AM – his real story quietly unfolded. 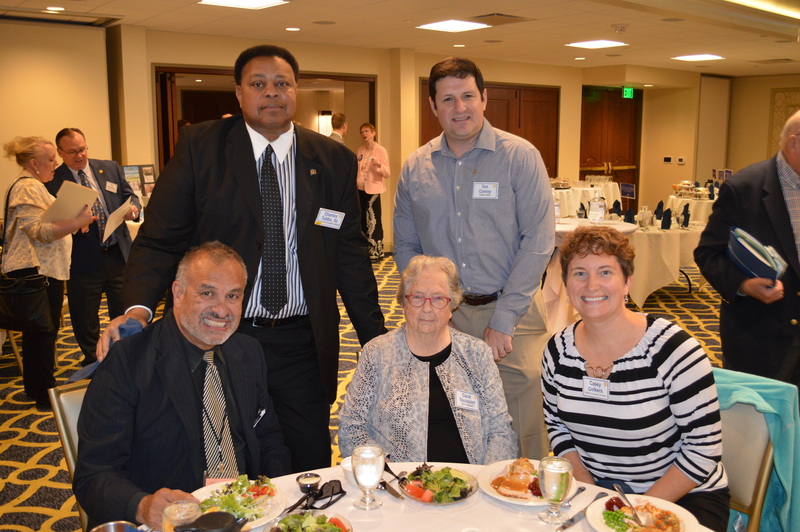 The real story was one of vision and collaboration as Peace Corps officials, with David’s involvement, and Rotary International leaders, with David’s parent’s involvement, finalized a four-year work in progress started by Peace Corps alumni in Denver. To promote global development and volunteerism, Rotary and Peace Corps signed a letter of collaboration, agreeing to participate in pilot programs in the Philippines, Thailand and Togo. Under the May 2014 agreement, Rotary clubs and Peace Corps volunteers are encouraged to share resources and knowledge to boost the impact of development projects. Opportunities for collaboration include supporting community projects, training, networking and community education. 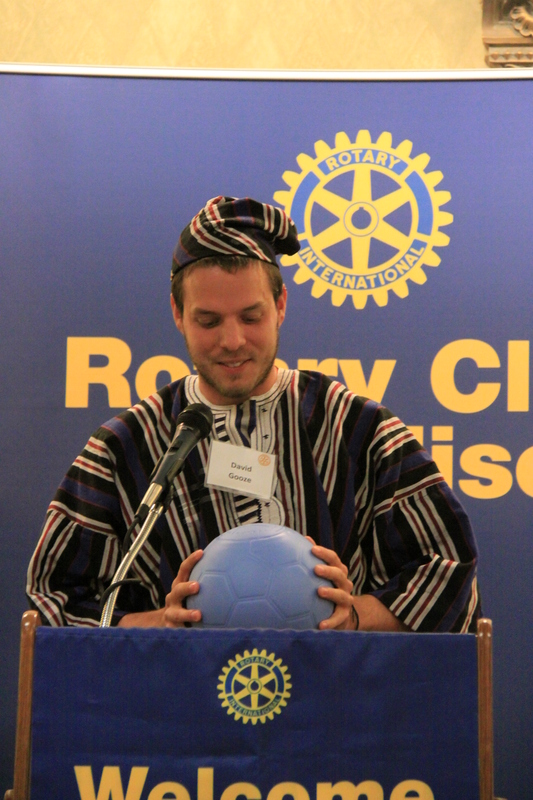 One of David’s major programs in Togo was to distribute more than 5,000 soccer balls to disadvantaged youth. He organized ‘More Than Just a Game’ sessions, which use soccer to teach children about malaria prevention. Before he brought these non-deflatable balls, children were using rolled up bags for soccer balls. He also helped teach modern honey-production methods. While David said the word stewardship doesn’t translate well into their local language, that is exactly what she was referring to and what she was learning. Gooze is a 2006 Oregon High School graduate and a 2010 Graduate of the University of Oregon.